Community Blog by Lenigod // The most expensive gaming peripheral I've bought. The most expensive gaming peripheral I've bought. 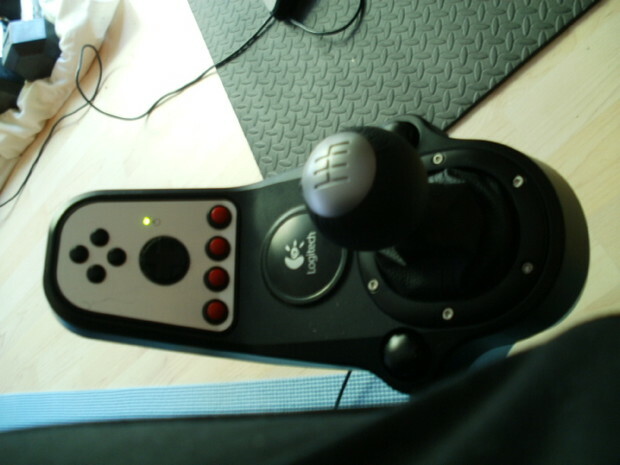 Rather recently, one of my close friends, purchased a Logitech g27 racing wheel, one of the top-o-the-line gadgets, that is designed for racing games on P.C, or ps3. It was rather neat, but the problem was how he had it set up to play. It was on a light table, and nothing stopped the pedals from getting pushed as you brake and hammer on the gas and what not. Suffice to say it was not easy to play with this �handy mans� set up. It was clear, you needed something designed to hold everything together nicely. Enter the playseat. 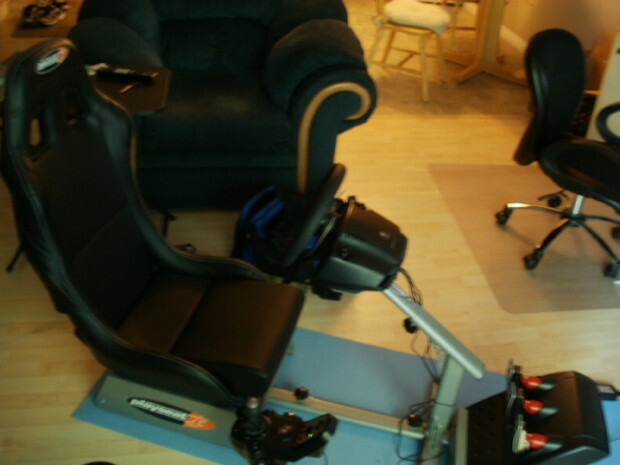 A seat and frame combo, specifically designed to house the Logitech wheel. And boy does it work well. The two paired together create an entirely new experience as opposed to the controller. It brings a whole new level of difficulty to games, having to systematically hit the clutch, put the gear shifter into the next gear, let go of the clutch, and back on the gas, is that extra something that just was missing completely before. The paddle shifters are a fun fast way to do things to. 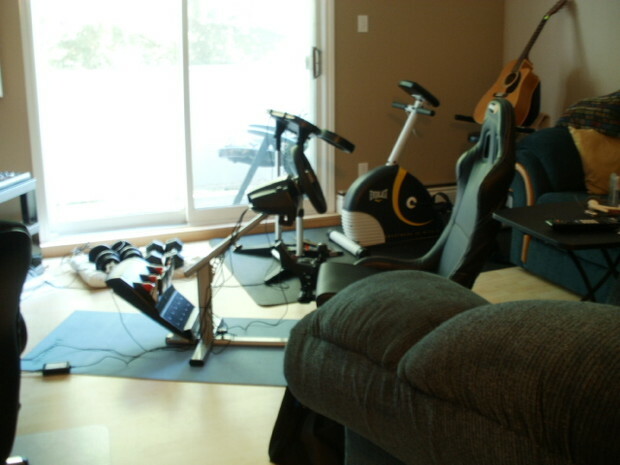 It�s that whole physical element of racing, that you just don�t get with a controller. The set is very sturdy and stable. It�s not come cheap piece of plastic that is going to break in a month, it�s a solid metal frame.You can crank the wheel left and right, and the set well stay in one place. It�s brilliant. The seat is leather, the wheel is leather, the frame is metal(probably aluminium), everything looks nice, and feels stable. Playing the wheel with a sim game. This is where the wheel shines. Cars with bad transmission take forever to change gear, cars without abs slide into every corner like a out of control rocket. Cars with bad handling slide around like a cat on an ice rink. It�s all fantastic fun, and it�s all amplified by having a seat, and a wheel to do it. This is where the controller feels like a compromise, and the wheel feels like what the developer intended people to use. If your jam, is these types of games, I would seriously recommend looking into the investment of a good seat, and racing wheel. Playing the wheel with a semi-sim game. 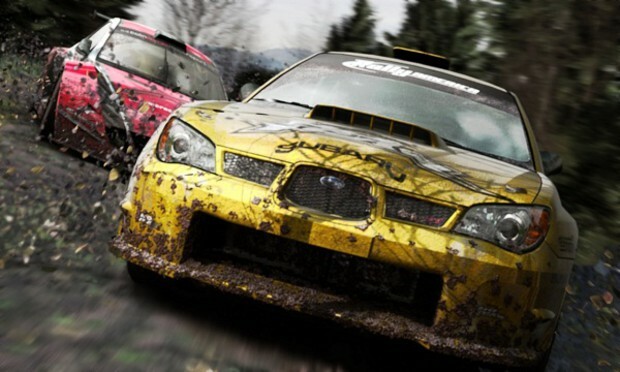 I wasn�t expecting much jumping into dirt 3 with the wheel. I honestly wasn�t even sure at first if it was 100% compatable. Boy was I surprised. 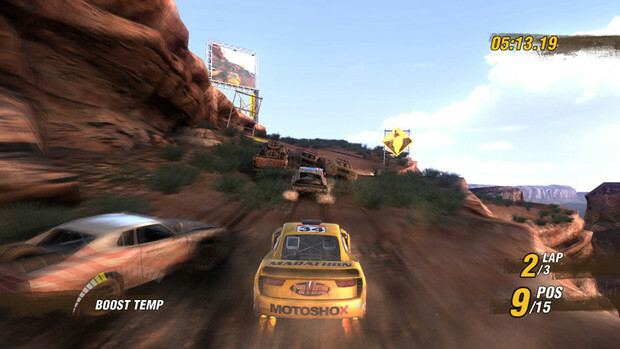 The wheel works so well with Dirt 3, and it is an incredible amount of fun. Speeding through the narrow corriders of a rally race, barely keeping up with the leader, and cutting corners just to gain that extra .002 seconds is such a thrilling experience in dirt 3. And having it work so well with a wheel is great. Dirt recognizes you have it connected, gives you a plethora of options and adjustables for your wheel and even lets you adjust small things like force feed back percentage. 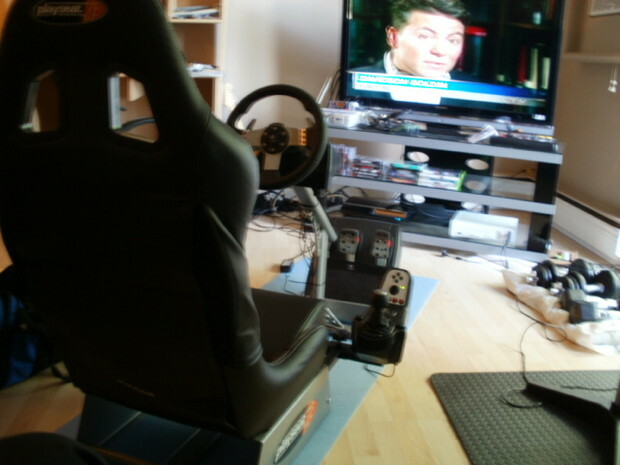 While the whole set up of a racing wheel and seat may be a tall order for a game like Dirt, I�d recommend at least getting a wheel and trying it out. Honestly, I don�t think I could play this anymore with a controller, it has to be a wheel, it�s that much better. V8 Superstars was rather boring with the wheel. While the game recognized it was connected, and what it could do, It didn't recognize the proper wheel, and instead gave me limited, but working functionality. I didn't find it that much fun with the wheel, but it wasn't broken in any way either. An Average experience for an average game. Playing the wheel with an arcade racer. Now here I wasn�t expecting much, and I was right. Before even trying any of these games, I�d suggest going to their perspective websites and looking if your wheel is even compatible. 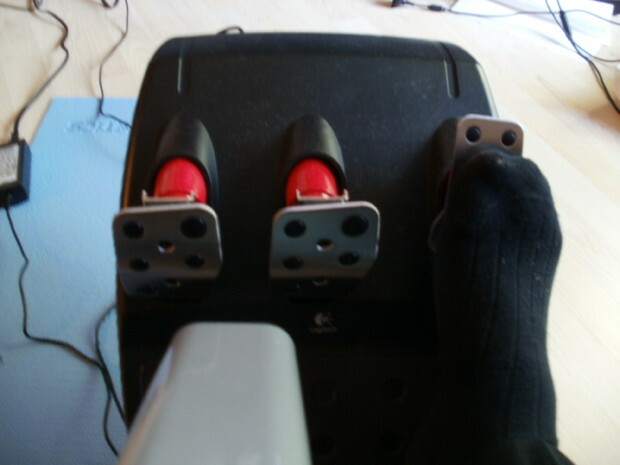 In Motorstom, the pedals didn�t work, because they are not mapped properly. It doesn�t recognize that you have a wheel plugged in, it just thinks it�s a controller, so the game does nothing to help you. What ends up happing is you press the red buttons in the middle of the wheel for gas and break, and the gas pedal is nos. It�s kinda cool, but any novelty wore off quickly, and I found myself back to a controller quickly. While you may find a cheap wheel fun to play with these types of games, I suggest not even bothering, as many might not even be compatible with your wheel, and it just doesn�t work for fast arcade games like Motorstorm. In the end, personally it's a worthy investment for me. I've spent countless hours playing racing games, and undoubtedly this type of gadget improves the gameplay ten fold. As much as a fight stick is 'required' to be 'pro' at fighting games, as some might claim, a wheel is the very same for racing games. The only palpable downside I can think of, is unfortunately the g27 is incompatable with the xbox. 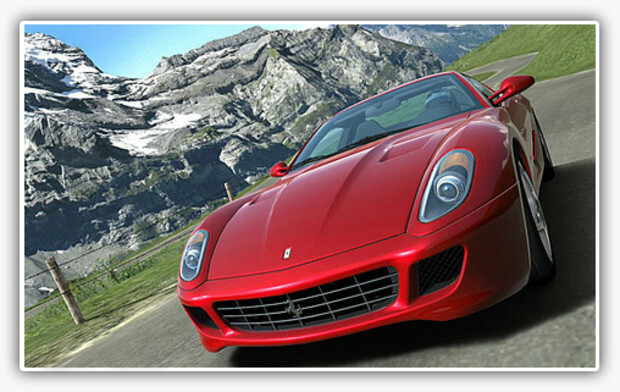 So Unless forza 4 is released on the p.c. as well, I won't be playing it with my wheel. Rather then ramble on any longer, here is a image dump of the set up in my condo!